New enemies, new mechanics, a new location. Rare has sketched an outline of the content that is coming to Sea of Thieves over the next few months. It feels generous to call Rare’s plans a roadmap as they are pretty vague, but whatever you call them, this is Rare’s response to criticism that its open world pirate game is comically empty. 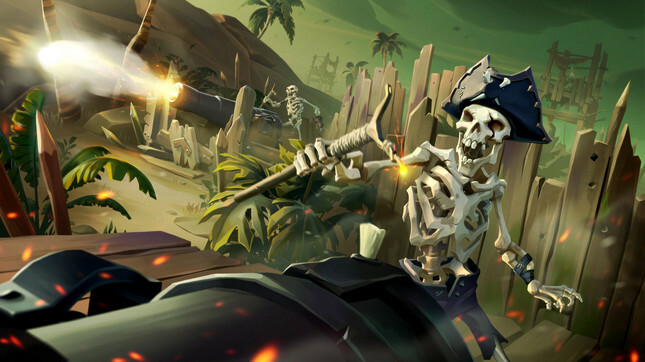 In May, Rare will add a new enemy and new mechanics to Sea of Thieves via a new event. This event will apparently encourage crews to work together to uncover and defeat the threat, and come with unique rewards for participating. The new mechanics weren’t detailed, but one is a new way to communicate with other crews. Rare also promised “within existing Trading Companies, introducing new ways to play”, which suggests the studio is adding a new mission type to the three already in the game. It is also promising more incentive and rewards for players to explore the world, and that unused areas of the game including underwater ruins and reefs will be included. More content will be added via weekly events, including cursed cannonballs, quests where you must find lost items for a new NPC, and a challenge where you must locate and platform your way to Skeletons Thrones sprinkled around the world. In winter, a ‘Cursed Sails’ update will bring another new AI threat and a new type of ship that is likely a three-man vessel, alongside new mechanics, features, and rewards. Also in winter, a ‘Forsaken Shores’ update that will add yet another AI threat, as well as a new area to explore, and more perilous adventures. Beyond that, three more major updates are planned.